Inspector Mark Evans of Sussex Police is very proud of his new patrol car. So proud, in fact, that he tweeted about it, which is perfectly fine: it’s a free country. 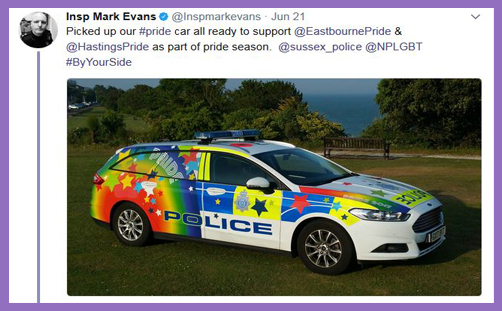 Eastbourne Pride and Hastings Pride are to be proudly policed by the new #pride car which will be #ByYourSide throughout. You must set aside your medieval bigotry and homophobic hate, and accept that if the police wish to spend their hard-pressed budget on making patrol cars fit for Noddy and Big Ears, that is their affair. It’s all about diversity and inclusion; approachability and bridge-building with minority communities. It is, if you will, heeding the exhortation of St Paul to become all things to all men in order that all might be defended equally for the sake of justice. Rainbow-coloured police cars are still empowered by the state to enforce the law, protect property, and limit civil disorder. If you think they look as though they belong in fairyland, your hate will only make Inspector Evans stronger. But when you put something like this out on Twitter, you’re almost fishing for a reaction. Best not to call it ‘incitement’, for Inspector Mark Evans is a senior police officer with many years experience and he knows incitement when he sees it (though he isn’t averse to a bit of stirring). There’s a summary of superficial reaction over on KentLive, most of it being concerned with the cost (£750) and policing credibility (“someone asking if the twitter account was ‘satire'”). There was some support, too: North Yorkshire Police thought the car was “Wow! Pretty!”, which makes you wonder why police officers don’t agitate to ditch their dreary uniforms and inject a permanent flash of Technicolor into law enforcement: the world of diverse communities and identities manifestly isn’t black and white (except perhaps for ISIS, but this car probably wouldn’t be very effective in policing that community). When is ‘hate’ hate, and when is it a joke? 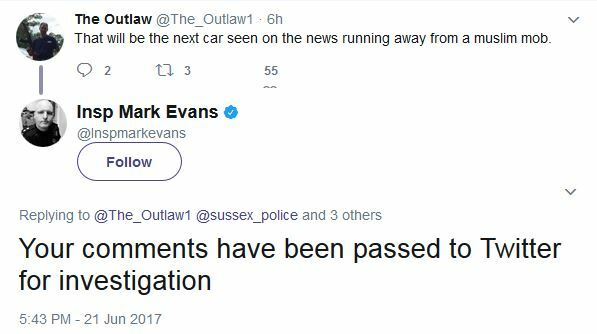 The problem here is that instead of reasoning with ‘The Outlaw’ to discover his concerns, Inspector Evans reaches instantly for the mute button – the permanent mute button, which is censorship. 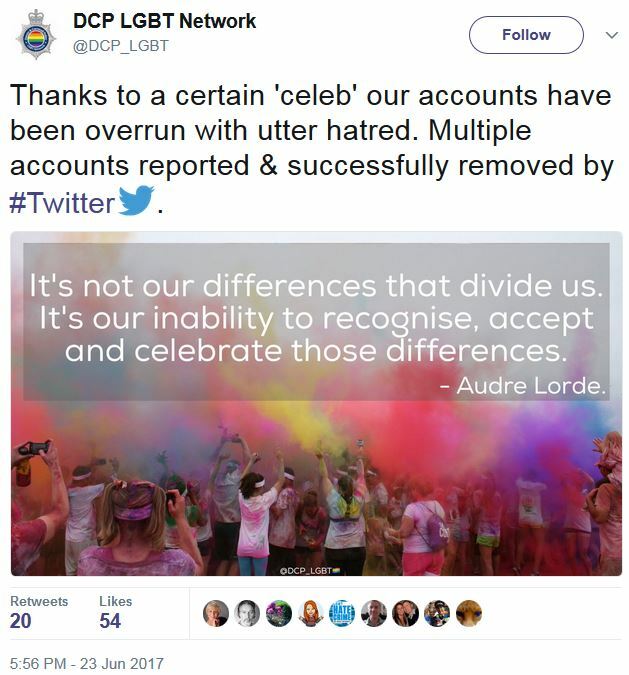 It is the same impulse which drives the Devon & Cornwall Police LGBT Network: “Multiple accounts reported & successfully removed”, they boast, as though the eradication of robust but justifiable criticism were good for society. 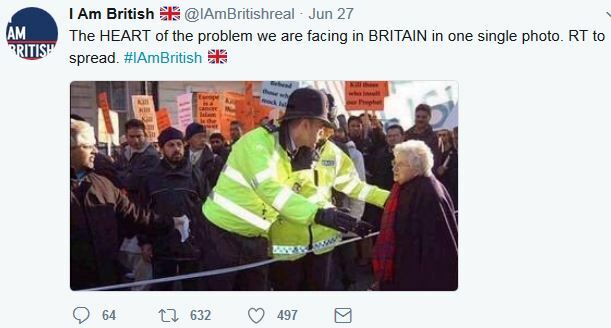 Note that it’s the Muslim mob which is protected by the police: the frail old lady has to move along. It is unlikely that these police officers turned up to this protest in their #pride car. Surely, in order to express solidarity with this community and to help fight Islamophobic hate crime of the sort being meted out by this old lady, the police need to spend another £750 on a #sharia car? You know, something emblazoned with لَا إِلٰهَ إِلَّا ٱلله مُحَمَّدٌ رَسُولُ ٱلله. Isn’t that what equality demands? As long as they don’t confuse events by turning up to Gay Pride in the #sharia car and Islamist festivals in a #pride car, all will be well. Is it really becoming unlawful to express concern about any of this? Is it really a breach of social media guidelines or Twitter’s terms and conditions to point out to a police officer the hypocrisy, absurdity and inconsistency of some of their ‘Diversity and Equality’ agendas? Do the police not grasp that their dour uniformity and standardised sobriety project credible authority and command public respect? Black and white are neutral, as law enforcement ought to be. Uniform colouring conveys objectivity and impartiality, not pandering to any single identity but present in the community for all, equally. 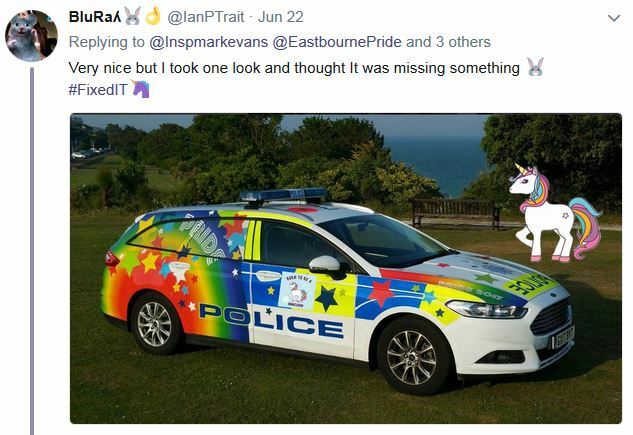 Have they not considered that a Pride police car might actually deter certain people from approaching it to report a crime? What shiny livery will the patrol cars of tomorrow be sporting in order to ‘reach out’ to persecuted or harassed minorities? Perhaps it’s impertinent to ask: it might offend against Inspector Evans’s snowflake sensitivities, and this blog will be reported (once again) for ‘hate’. Good job he isn’t armed, isn’t it? Momentum drops commitment to nonviolence: how can CofE clergy be permitted to join this group?